There are many opportunities in international markets to expand your market, grow your business and spread risks. Technology and innovation are making country borders fade. This makes it easier to do international business. Many SMEs are struggling to successfully enter foreign markets. That is why entrepreneurship, trade and investment promotions are very important. Not only to stimulate economic development but also to give them a helping hand to successfully expand. Within the Dutch Kingdom, there is much knowledge and many contacts available to share and to strengthen our economic power and diversity. To promote trade and export, The Netherlands Enterprise Agency (Rijksdienst voor Ondernemend Nederland – RVO) recently made some of their export subsidy instruments available for companies established in the Dutch Caribbean. Companies in Aruba, Curacao and Sint Maarten can use these instruments to engage in international business. The Netherlands Enterprise Agency (RVO) is part of The Ministry of Economic Affairs and Climate Policy of The Netherlands. They provide support to enterprises in The Netherlands with sustainable, agricultural, innovative and international business activities. The Agency provides tools such as: subsidies, help in finding international business partners, knowledge and compliance with international laws and regulations. Since January 1, 2018 business from Aruba, Curacao and Sint Maarten can apply for different services and subsidy programs offered by RVO to promote trade and export. Starters International Business (SIB) is a program that can help companies move into foreign markets. The SIB consists of vouchers to help business spread their risks and help with planning to take businesses abroad. Different types of vouchers are available such as: consultancy to explore opportunities and make a concrete action plan, participate in an outgoing trade delegation or acquisition vouchers to hire a lawyer or tax consultant with export expertise. It aims the companies that are in the export oriented phase. The business partner scan is a program that helps connect companies with the right international business partners. It aims at companies that have export plans, know their foreign markets and are looking for business partners. RVO, embassies and consulates, Netherlands Business Support Offices (NBSO’s) offer a business partner scan with a personal introduction to potential international business partners. The Partners for International Business (PIB) aims to position exporting companies in (additional) promising foreign markets. The government, private sector and different institutions support companies with a structured approach. The Kingdom of the Netherlands has an extended network of ambassadors, consultants and Netherlands Business Support Offices (NBSO’s) to successfully execute the PIB program. The DHI (demonstratieprojecten, haalbaarheids- en investeringsvoorbereidingsstudies) scheme supports SMEs with international ambitions that are interested in emerging markets and developing companies to invest or execute a project. It is a tender program where tenders can be submitted during different tender periods. The DHI scheme consist of 3 modules; project demonstrations, feasibilities studies and investment preparation studies. The programs apply to trade and investment in countries outside the Kingdom of the Netherlands. They are offered in cooperation with local partners and under the same conditions as those applicable to companies established in The Netherlands. 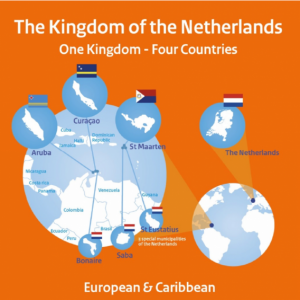 The Minister of Foreign Affairs of the Netherlands, through The Netherlands Enterprise Agency (RVO), and the Representation of the Netherlands (VNOA), together with the support of Aruba through Exprodesk, assist Aruban companies to increase their international opportunities and expand their businesses. Exprodesk offers information and assistance to local companies that want to make use of the subsidy programs offered by The Netherlands Enterprise Agency. Exprodesk works together with Free Zone Aruba, Aruba Chamber of Commerce and Industry, ATIA, ARINA and the Department of Economic Affairs. For more information about the subsidiary programs you can visit www.exprodesk.com or www.rvo.nl.